Like any significant and grand change in our lives be it a career choice, marriage, starting a family, or starting a hobby – it started with a dream. In late 2001 the tragedy of 9/11 spurred us to do the same as many others were doing, re-evaluate our lives in terms of priorities and what-ifs. It was a real wake-up call that it was time to reflect on the past and make improvements in the now. We started envisioning a life that included living on the ocean, purchasing over an acre of land and building our dream house on it, being able to sail, and living in a small down to earth community that included people from all walks of life. Since we were living in New Jersey and working in New York City, we limited our search to coastal areas on the east coast of the United States. We were comfortably middle-class but not wealthy, with a mortgage on our modest house and two children left to put through college. I told you it was a dream. However despite obstacles, we accomplished it. Today we live in a modern and spacious, elegant but simple three bedroom house nestled in 4 acres of secluded, wooded property on a picturesque warm tidal swimming cove of the Sunshine area of Deer Isle, Maine only 20 minutes from the fishing village of Stonington. While we were looking for a place to eventually retire to, we also wanted a place that would be the hub of family vacations. A place where we could enjoy the attributes of the ocean – beach, sailing, kayaking, hiking, and seeing wildlife. A condo or a timeshare wasn’t going to cut it. We needed a vacation spot within a community where we could partake of the community life albeit only a few weeks each year. And so started one of the great adventures of our lives, one we shared with our children and our friends. We harkened back to the movie, “On Golden Pond”. This would be the place when we removed all vestiges of our busy lives and settled down to getting to know and enjoy each other. p.s. My husband Bob Wilson is the photographer. He’s excellent and I know as you read this blog you will be as amazed as I am at some of his photos. This entry was posted in Building a Cottage, Retirement/Reinvention and tagged 9/11, active, beach vacation, best vacation, Bob Wilson, Bob Wilson photography, Coastal Maine, community, deer isle, Deer Isle real estate, Downeast Maine, family trip, family vacations, living, maine, Maine real estate, ME, photography, photos, real estate, retire, retirement, Robert Wilson photography, sailing, senior, Shawn Phillips, stonington, vacation, vacation spots. Bookmark the permalink. And a beautiful spot it is! May you stay wahm in the wintah, and cool in the summah. congratulations on your new blog. it’s great to have this window on your new mainiac world. What a beautiful home in a majestic location. We are very excited to come visit again. Of course you are always welcome! Let’s plan a time that works for you and your lovely family. What a wonderful way of writing you have! A gift! I love this photo you have there under is blog. It is so pretty and I think it would make a beautiful painting. 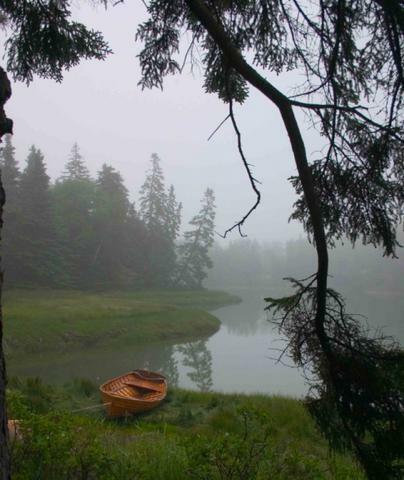 Wow – I LOVE this photo of the boat in the mist. I look forward to reading more of your entries – not just moving to Maine, but moving across the windy bridge to Deer Isle is very impressive!